3 Quick Hang Straps that are each 6 feet long. Great for Use with any “Classic” or “Backyard” style swing! Our Quick Hang Swing Kit is the ideal solution to getting your swing up and running in minutes. Made from high quality materials, 3 Quick Hang Swing Straps will work great for any swing you choose from our creative selection. 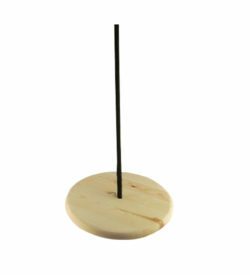 Will fit around most large sized tree branches. 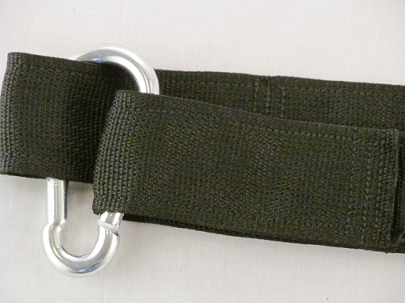 Straps are made of 2 inch wide material and are 6 feet long each. A wider strap prevents damage to the tree by distributing weight over a larger area. Each Quick Hang Strap can support up to 500 lbs. Using your Quick Hang Straps will provide a smoother ride on your wood tree swing. Eyelets are made from high quality brass for outdoor durability. Each kit comes with 3 Fast Hooks. Fast Hooks each support up to 320lbs. Each Fast Hook attaches to a Quick Hang Strap through the brass eyelets. Fast Hooks have a zinc finish to prevent damage from the weather. 30 feet of black Polypropylene rope (10 feet/side and middle). Water Resistant, will not absorb moisture. Long life span for outdoor use. Additional rope available by the foot!